My first Second Life building project was the 1st Yordie’s Zen Garden. And when I dismantled the 7th garden a few months ago, it felt like that would be the last of my Zen gardens. Nonetheless, there’s a part of me that just loves Zen and Japanese style in general. My new home in Martha’s Vineyard is a total joy, but I’ve been thinking a lot about those bamboo forests of the past and have wanted a taste of Japanese style back in my life. So, seeing as I have a space problem in my new home (only 2 rooms), I conceived of a little sky platform where I could place a Japanese style bedroom. It was a pretty simple project. I just took some of my bamboo out of inventory, redesigned the old Harvest Moon Cafe hut then furnished it with a couple things from one of my old Japanese houses. Oh, and I put up a wonderful rain cloud. Like, what is better than rain on the roof while you sleep! Anyway, I didn’t have a lot of prims to work with, but I think the result is cozy and functional. Yeah, that’s rain! A little “sun shower” as evening settles in. And how could I not put up a photo of the harvest moon in the old Harvest Moon Cafe. Got my taste of Japanese style and I’m happy. 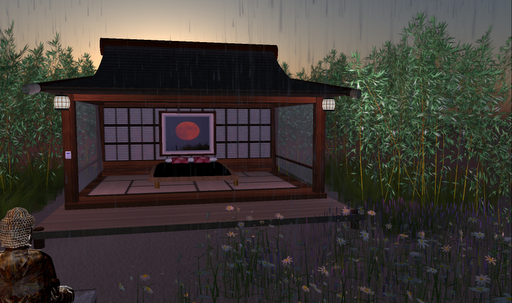 This entry was posted in Features and tagged Homes & Gardens, Second Life. Bookmark the permalink.